New York, New York...its a Wonderful Pizza! Right before my birthday, we were running around like crazy people, per usual. I had a Saturday event at work, it was the kickoff of Octoberfest at Whitestone, and I was busy living my life. After a long day, the last thing I wanted to do was cook dinner. We decided to give Russo’s New York Pizzeria try. I heard some great things, so we headed over. It was a little later and we were seated right away. It was a cute restaurant with plenty of room. I also liked that they had a dessert case with desserts brought in from a New York bakery. We started with the Cauliflower Fritti. Apparently, I needed to wait until my late 30’s to discover that I love cauliflower. This was delicious. I am not always a fan of fried things, but this was amazing, especially when paired with marinara. Next, we ordered pizza. Being from St. Louis, we enjoy a thin crust pizza and were excited to see that they served several option of thin crust square pizza. We chose the Paesano Napolitano, which was topped with pepperoni, sliced sausage, roasted peppers, red onions, Romano cheese, olive oil and garlic. We definitely enjoyed the pizza, too. It was cooked perfectly and had several of our favorite things. Mike also loved that there was a generous portion of pizza, resulting in leftovers! After eating cauliflower and pizza, after a day of beer and pretzels, I was pretty full. However, our waitress did a great job convincing me that I needed to take home a piece of red velvet cake. She wasn’t wrong. My birthday was coming up and I didn’t feel like baking my own cake, so this looked like a great choice. I loved that there were layers of a dark chocolate ganache mixed in with the red velvet and cream cheesy goodness. 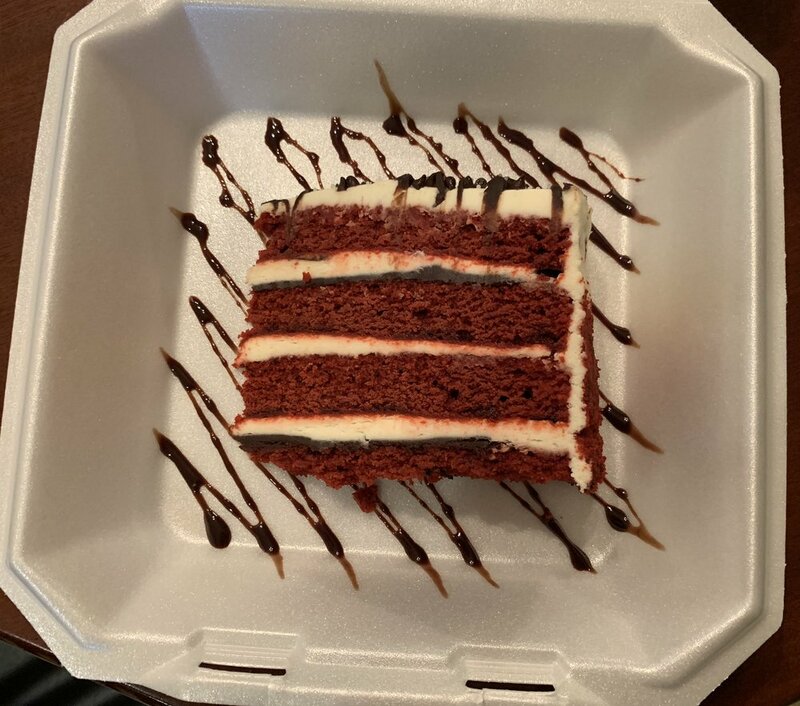 This piece of cake lasted a few days of snacking for me and was quite a delicious choice for a birthday dessert. We were very happy with our entire Russo’s experience and would be happy to go back to sample more items from their enticing menu.